Is your pet having difficulty walking? If you care for an older, injured, or disabled pet, you have come to the right place! A Wheelchair, accessories or other aid will make them mobile again, ready to play and get exercise for a more happy and healthy life. 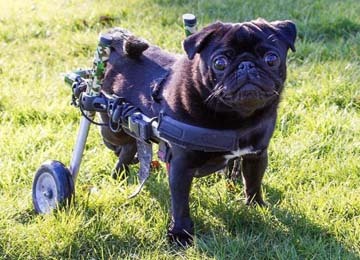 Pets, especially dogs, lose the use of their legs for a number of reasons – accident, old age, slipped disc, cancer or a degenerative condition such as hip dysplasia or degenerative myelopathy. We understand as we have been there and the Walkin’ Wheels® range can be the answer. 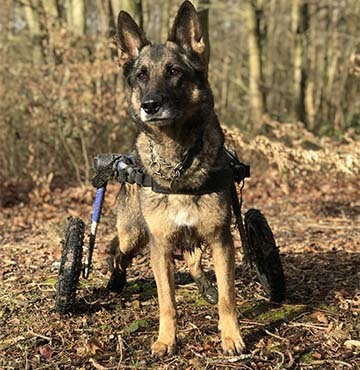 The Walkin’ Wheels® wheelchair is available to fit pets such as dogs, cats, rabbits, lambs and goats weighing 1 – 81kgs* (2 – 180lbs) and come with a 5 year manufacturers guarantee. *Please ask if you dog weighs more than 81kgs. Walkin’ Wheels® are different from other pet wheels because they are so completely adjustable. We have a wide range of Walkin’ Wheels® products to help your pet – harnesses, splints, drag bags, boots, beds and accessories. We are the official UK importer and stockist of the Walkin’ Wheels® range. We have jumped through all the hoops of importation including the Customs clearance, paid all the international shipping charges, any import duties and the VAT. We have the most popular products in stock in the UK and offer spares, support and advice. All this not only saves you time and money, but enables you to help your pet regain mobility in days rather than weeks or even months, when compared to importing from the USA yourself. We help you every step of the way to help you make the right choice for your pet. We are also here for after sales help and support.